If you’re feeling under the weather or you simply need a hug-in-a-bowl to comfort you on these cold wintry days, I recommend making yourself some warming and aromatic vegetable pho. Last week I came down with a nasty cold. The thought of leaving my cosy flat to go on the hunt for a tin of uninspiring soup didn’t appeal, so instead, I decided to conjure a vegetarian pho up from the ingredients I had at home. Pho (pronounced ‘fuh’) is a Vietnamese noodle soup, traditionally made with rice noodles, meat and herbs, covered in a broth made from stock. After having a look at some inspiring and achievable vegetarian pho recipes on thekitchn and ohmyveggies I was confident I could knock something tasty and revitalising up. 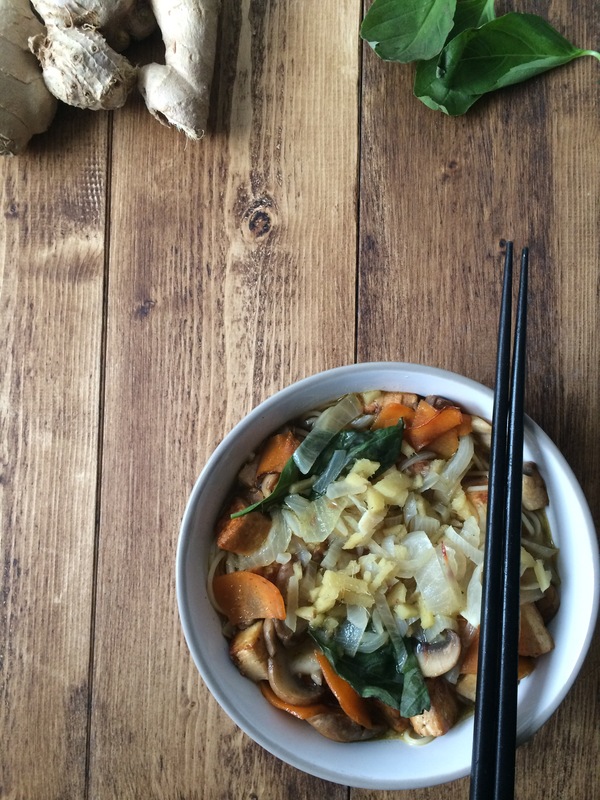 This Vietnamese-inspired vegetable broth consists of a fragrant gingery broth, soft silky noodles, sweet carrot ribbons, chestnut mushrooms and soy-marinated tofu. An earthy and warming ginger and onion broth makes up the base of this pho. The punchy taste of ginger is balanced out the sweet addition of hoisin sauce. It looks inviting; a steamy bowl full to the brim with silky noodles, spices, herbs and vegetables. It smells like a healthier version of super noodles – I mean this in a good way – a comforting smell; your senses know this will make you feel better. I used these ingredients because they’re what I had in the fridge, but you could easily swap out the veggies and tofu, depending on your preference. Drain the tofu by wrapping it in kitchen roll, placing it on a plate and propping a couple of heavy kitchen objects on top – like a wooden chopping board and a large frying pan. Leave for as long as possible for the water to drain out; though 15 minutes should be enough. Boil the kettle with at least 500ml water. Finely chop the stock cube and put into a measuring jug. Pour 500ml boiling water into the jug and whisk until the stock cube has dissolved. Halve and thinly slice the onion or shallot. Peel the ginger and either finely chop or grate it. Put a large saucepan on to boil, adding the onion, stock, ginger and salt, and simmer gently for 15 minutes. Meanwhile, cut the mushrooms into quarters. Chop off the ends of the carrot and finely slice, using a mandolin if you have one. Put a non-stick frying pan on a medium heat and pour in the oil. Fry the mushrooms and carrots until they soften up. While the veggies are cooking, unwrap the tofu from the kitchen roll and chop into small cubes, roughly 4cm. When the veggies have cooked, set them aside. Add the tofu to the pan and cook for five minutes, turning frequently with a fish slice. Pour in the soy sauce and continue to cook until the tofu has browned up – roughly another five to seven minutes. While the tofu is browning up, cook the noodles by the pack instructions. Add the chilli flakes to the tofu pan, along with the cooked mushrooms and carrot slices. Pour over the hoisin sauce, reduce the heat and cook gently for another five minutes. Transfer the cooked noodles to a soup bowl, followed by the tofu and veggies, as well as the basil leaves. Pour over the gingery broth and serve with chopsticks for noodle grabbing, along with a soup spoon for broth slurping.